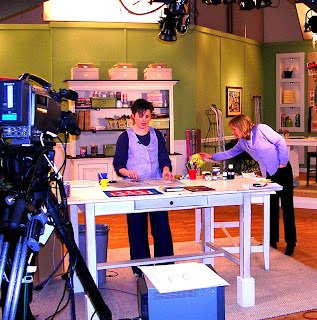 Here's Lyric Kinard doing her thing on the set of Quilting Arts TV. She was so professional and a delight to get to know! That's the marvelous Helen assisting. We had dinner with Cedar Canyon Textiles guru/founder Shelly Stokes and her visiting artist Sue Kelly. I learned so much!